From the outside looking in, Joan Steele has everything--her health, a beautiful home, and six wonderful adult children. But deep inside, she’s missing what every woman wants. A man to love and share her life with. 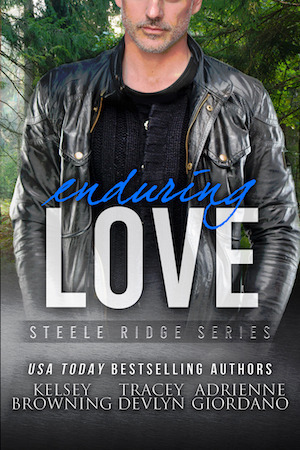 When an ex-convict shows up in Steele Ridge, Joan knows he means to do her family harm. And she can’t help but put the blame at her estranged husband’s feet. After twenty years of marital limbo, Joan has sacrificed enough for the man. Now she vows to fight back, but will her family’s broken past destroy her future with the love of her life? One thing Joan Steele knew about the past was that it never went away. No matter how much she might want it to. She stood in the center of an ancient motel room, its lime-green shag rug and floral bedspread making her wonder just how her path had led her to this place. The past. It never went away. The man who’d captured her heart hovered near the large front window, peeping through the curtains to the parking lot. He was here with her now, but if she faced the truth, she’d never completely have him. As much as she loved him, having him meant sharing with the past. With his devastating, soul-sucking demons. All of it held too much power over them. Still, she couldn’t let him go. He mulled it over for a second, tilting his head one way, then the other, before checking the parking lot again. Joan held up her hands. How many times had he thought he’d recognized someone only to have it turn out to be a random stranger? Five years they’d been doing this. Meeting in this same motel, varying their schedules, switching rooms, doing whatever necessary to avoid being, as Bear put it, tailed. Well, Joan had hit her limit. For a change, she wanted to make love in her own damned bed in her own damned house. Heck, on a beautiful summer day, like today, she wanted to make love on her own damned porch. Wouldn’t those boys of hers love that? Still locked onto her arm, he dragged her toward the rear of the room. This man. God only knew what he had in mind. His voice held the cutting sharpness of irritation. Plus, he’d called her Joan and not his playful nickname of Joanie. Whatever rabbit hole he had jumped into, he’d done it with the full spiraling force of his protective instincts. His gaze shot to the door, then came back to her, as always, paralyzing her. From the first time she’d seen him, he’d done her in. Back then, between the contrast of his eyes and his jet-black hair coupled with carved cheeks that molded into a strong jaw, what was a woman to do? Throw in the sarcastic humor and a need to make the world right, and she’d fallen hard. “Seriously? You can’t wait until we get into town?” Britt Steele asked his brother, coasting into Motel Malibu’s parking lot. “Hurry up, princess.” Britt rested his wrist on the steering wheel and rapped his fingers on the dusty dashboard. After spending the day in Weaverville, all he wanted to do was get home, coax Randi into bed, and curl his naked body into hers. But first, he had to get rid of his shithead brother. A gray-haired gentleman sporting tat sleeves nodded at Reid on his way into the motel office. The guy stood a few inches shy of six foot and his biceps rivaled Reid’s, even though his brother had to be a good thirty years younger. An image of his dad flitted through his mind. Eddy Steele might not be as broad and solid as Mr. Biceps, but he kept his body honed by hiking the mountains surrounding his cabin. Many times over the years, Britt wished his dad had spent less time in the wilderness and more time with his family. But the old man hadn’t, and he’d stopped crying about it when he was twelve years old. A curse and hard rattle penetrated his thoughts, and Britt angled his head around to find Reid grasping the top of the vending machine and pulling it forward. The damn fool was going to splat himself if he wasn’t careful. His attention wandered down the front of the one-story motel. Malibu wasn’t unlike any other cheap roadside inn. Though the façade wasn’t much to look at, rumor had it that the rooms were clean and the staff pleasant. The lot in front of him was empty, save for a lone vehicle tucked around the corner of the building. Almost as if the driver wanted to hide his presence from passersby. If that was the case, he’d picked the perfect spot. Large shade trees provided a natural barrier between the lot and highway, and the canopy cast a concealing shadow over the car itself. This motel had likely seen its fair share of illicit liaisons in its long history. But something about the car seemed familiar. Seemed . . . He leaned forward, praying to holy hell that he wasn’t seeing what he thought he was seeing. A knot coiled in his stomach. Sure enough, there, at the end of the building, sat a familiar, sturdy Subaru. The gouge across the back fender evidence of the driver’s poor backing skills. “Sonofabitch.” Britt bolted from his truck, not even bothering to kill the engine. Joan stood next to Bear in the ancient bathroom. The potent odor of bleach permeated the air and the circa 1970 porcelain sink gleamed. The place was old, but it was clean. He slammed the lid down on the toilet, stepped up, and unlocked the half-window, poking his head out. His wide shoulders hugged the frame and Joan let out a sigh. How he intended to get through there was a mystery. He hopped off the toilet, sticking the landing with ease for a man in his seventies. And that’s all it took for Joan Steele to fall in line. There were times she thought this man nuts, stone-cold crazy. But other times? Like now. Knowing what he’d been through, the sacrifices he’d made, she understood. Literally felt his pain. Still, she’d had enough. The sneaking around. The lying to her children. All of it. She wanted a life. A normal life that didn’t involve illicit secret meetings and hiding. He grabbed her by the cheeks, kissed her, and before she’d opened her eyes was back on top of the toilet, putting a leg through the window. Seconds later, he was gone. That fast, he’d slipped through. She shook her head. Damned man, making it look so easy. If she got hurt, she’d have to explain this to those pain-in-the-rear boys of hers and she’d never hear the end of it. Worse, they’d probably hire bodyguards when all she wanted was to get a little love. Lord! She stepped onto the toilet, blew out a hard breath, and eyeballed the window. Small. Definitely. Roughly four feet from the floor. It wouldn’t be impossible to work her way through there, but she’d have to be careful. The window was awfully small, though. Using her hands, she measured the width of her hips, comparing it to that of the window. Not wide enough. No way. She knew that. This man had always protected her. Always. Feet first was definitely the way to go. She tossed her purse out and hooked her fingers around the frame before sticking one leg out. She brought her leg back inside, worked her upper body through the window and boosted herself up, landing jackknifed with her torso on one side and her legs on the other. A second of adrenaline-induced panic gripped her and a squeak shot from her throat. In an effort to move this operation along, she rocked her hips, wiggling forward like some sort of deranged caterpillar. Bear let out a snort and she looked up at him, found his eyes plastered to her undulating hips.